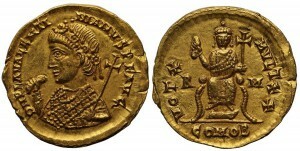 Constantius was a very competent Roman general who made his first appearance in history during the early Fifth Century. Like many of the Roman Empire‘s most illustrious military men, he had been born in Illyria. It is most likely that he had attained the rank of Master of Soldiers and Cavalry in the service of the Roman emperor Honorius by the year A. D. 411. He swiftly ended the rebellion and usurpation of Constantine III by trapping him in the city of Arelate. Constantine III held out for three months, then surrendered the city after the besiegers promised to spare his life. 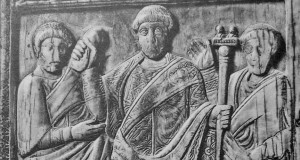 Honorius refused to honor the promise of clemency and had the ex-emperor and his son executed thirty miles outside the city of Ravenna where Honorius maintained his residence. Constantius was appointed patricius, and in 417 consul for the second time with Honorius as colleague. He married Galla Placidia and they had two children, Justa Grata Honoria (born 417 or 418) and the future Emperor Valentinian III (born 419). In 420 he was appointed consul for the third time, with the Eastern Emperor Theodosius II as colleague. On February 8, 421, Constantius was appointed co-emperor with his weak brother-in-law, Honorius, becoming the real master of the West. Curiously, he complained of the loss of personal freedom implied by the new role. The elevation of Constantius, however, was not recognized by his colleague in the East, Theodosius II, who was the nephew of Honorius. It is said that Constantius was organizing a military expedition to the East to have his rights recognized when he died suddenly on September 2, 421, after just seven months as emperor, the archetype of able soldier and politician that the Western Roman Empire desperately needed at the time. A struggle to replace Constantius swiftly erupted, with some open fighting. 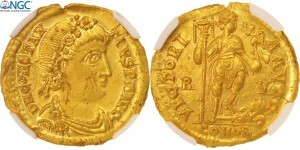 Galla Placidia fled with her son Valentinian to Constantinople. Her brother Honorius, still childless, died in 423. If Constantius III had lived longer, many historians believe that the history of the Roman Empire in the West would have been much different. He was an excellent general and had shown that he could effectively keep the barbarians at bay. He was also a talented administrator. This was the precise combination of qualities the empire needed in these times of crisis, and he may have been able to forestall the collapse of the West for another 50 years if he had lived another ten years or so. Honorius died two years later also and the government of the West without any solid leadership.